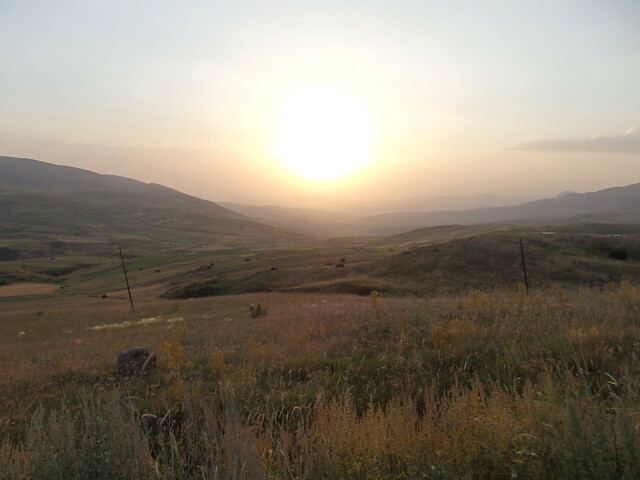 I cycled off from Yerevan in the burning sun. 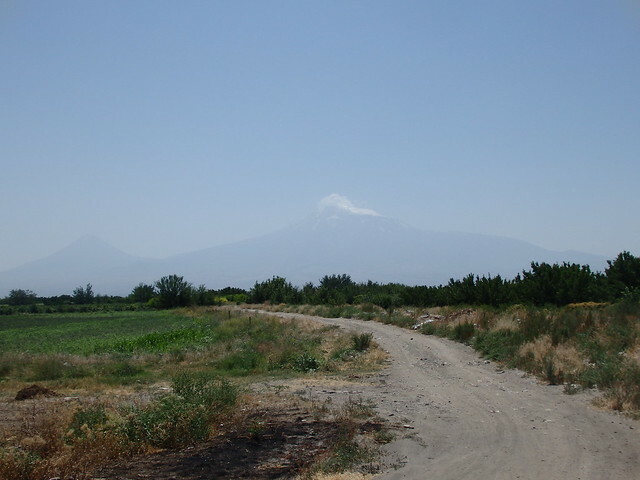 For a good while the road was nice and flat and there was only one mountain in sight – the two unmistakable peaks of Mount Ararat, the Armenian icon (that now lies 40km into Turkey). 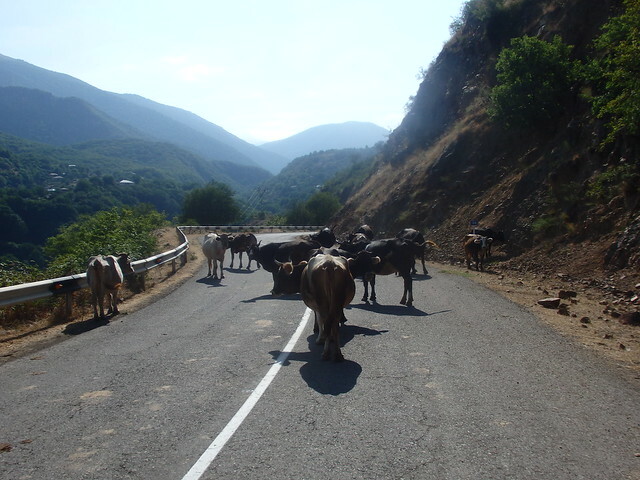 And so I had some company for the big climb to the first pass. 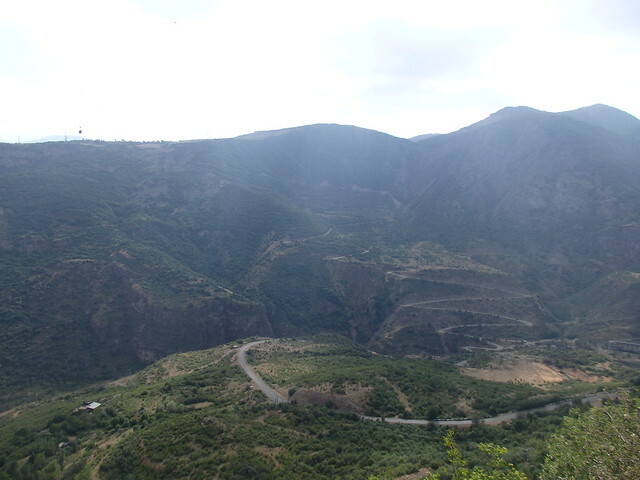 A narrow gorge closed in on us before we reached a high enough altitude for the mountains to spread out around us. It was exhausting, but I was happy to have someone a little quicker than me to push me up to the top. It was clear that we wouldn’t make it to the next town by dark, so we pitched our tents in a field just off the main road, where there were neat haystacks already in place to make benches to eat from. 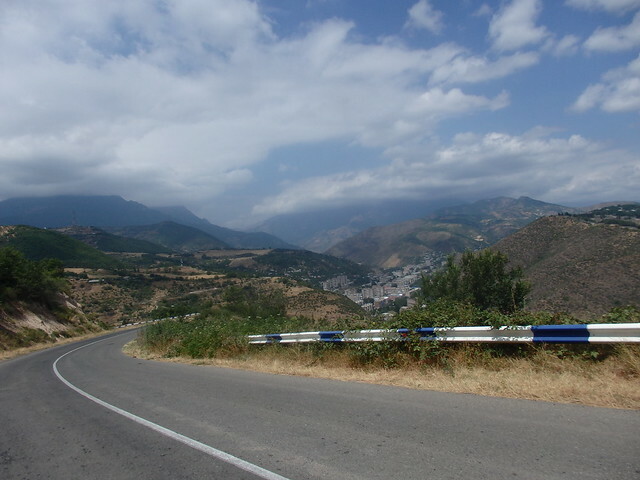 Started the next day with a big downhill before another exhausting mountain pass. 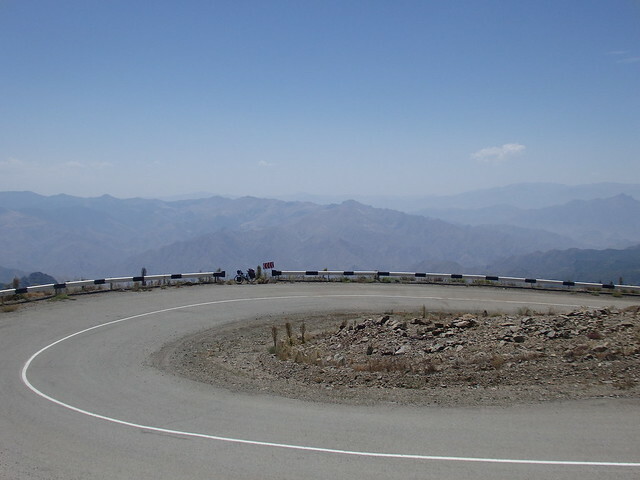 This one nearly killed me – it went on for ever and ever before we finally reached the big monument at the mountain top. There was a single water spring at the top but a huge queue of people for it – clearly very ‘good’ water. Bert wanted to push on to the next town, but I’d had enough for the day (we’d climbed about 2,300m by this point and there was another big hill before the town). So we parted ways – he needed to be in Iran much quicker than me and I wasn’t in that much of a rush. I found somewhere to camp near a lake on the top of the mountain. 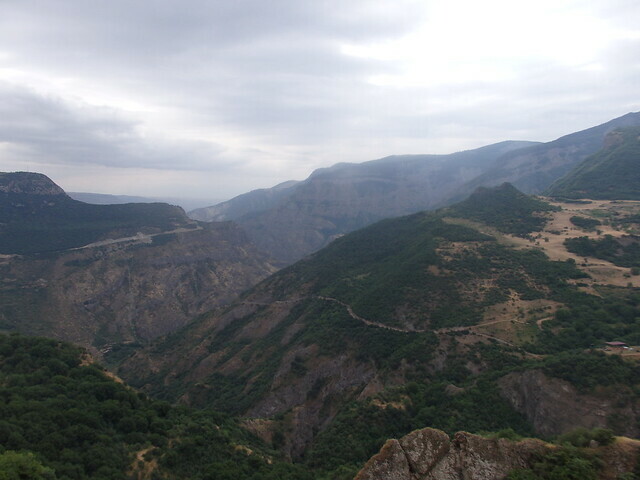 There were some long and remote sections on the road to Tatev. It was more flat, but a nasty headwind came out to slow me down considerably. I was starting to get hungry and had run out of food, but still no villages to be seen. Luckily, a family of farmers called me over on cue and I was invited to join them for lunch – perfect! 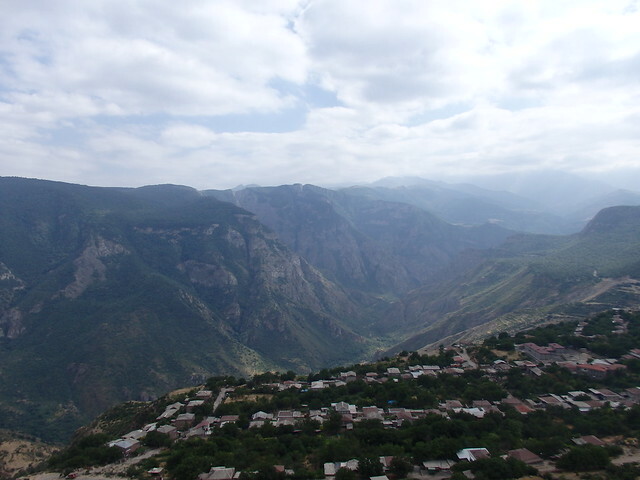 I was going to stop for the night before the monster climb to Tatev monastery but I had enough time left in the day for the challenge. 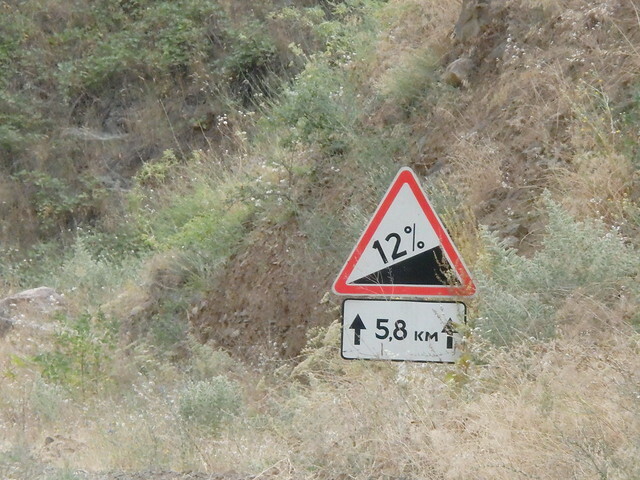 The climb was super steep, but only over about 8km. 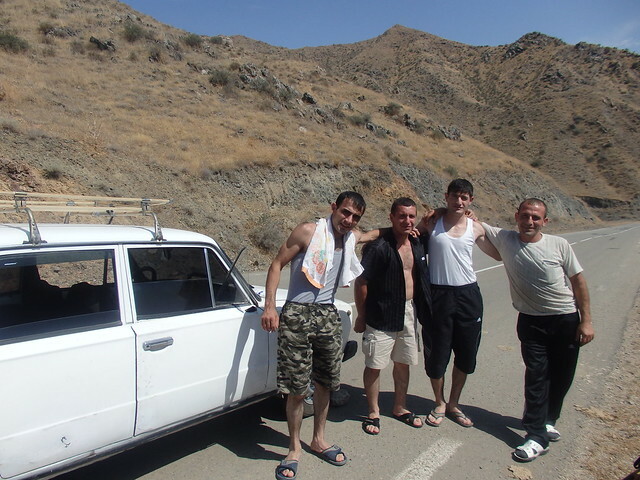 Armenians love their barbecues (apparently that’s another thing they’re best at in the world) and I was invited by a group just before I had my last push up the mountain side. I was given the usual supplies – some herbs, lots of lavash (flatbread that goes with everything) and more of that salty cheese that I really can’t stand. The cheese wrapped in lavash combo is one of the driest things I’ve ever eaten in my life… I don’t know how the Armenian’s enjoy it. 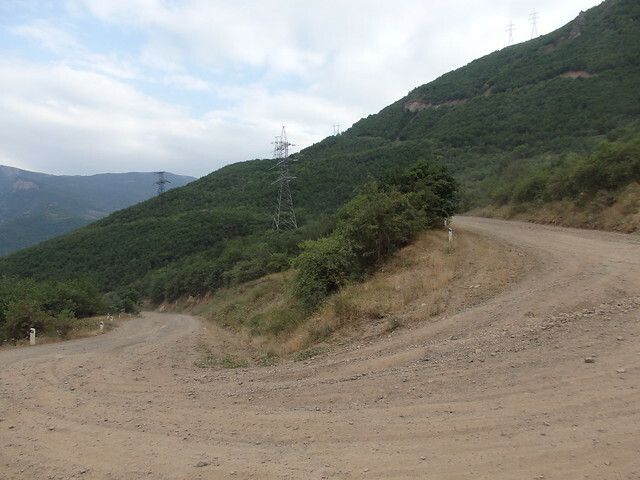 I soon saw the Tatev challenge – the road hair-pinned all the way down the side of the mountain super steeply, and then zig-zagged up the other side equally sharply. It looked like a workout and a half. 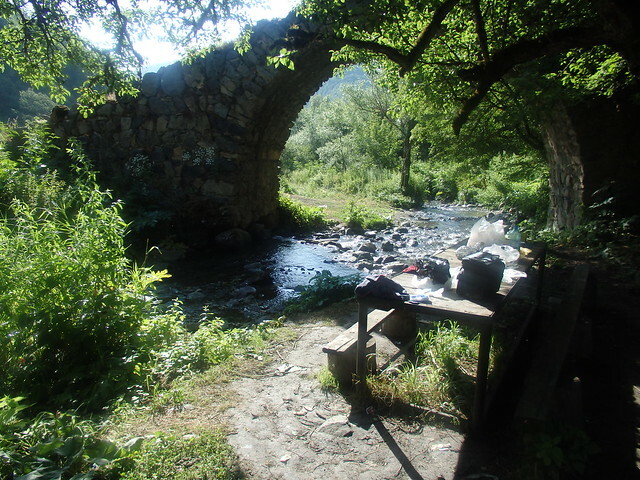 At the bottom I crossed the ‘Devil’s Bridge’, where some large rocks had fallen into the gorge (a very long time ago) creating a natural pass between the mountains. I stopped to fill up my water bottles but to my dismay the spring was one of those natural sparkling water spots – yuck! I hate sparkling water and I keep on buying it by accident too as I can never read the writing on the bottles. 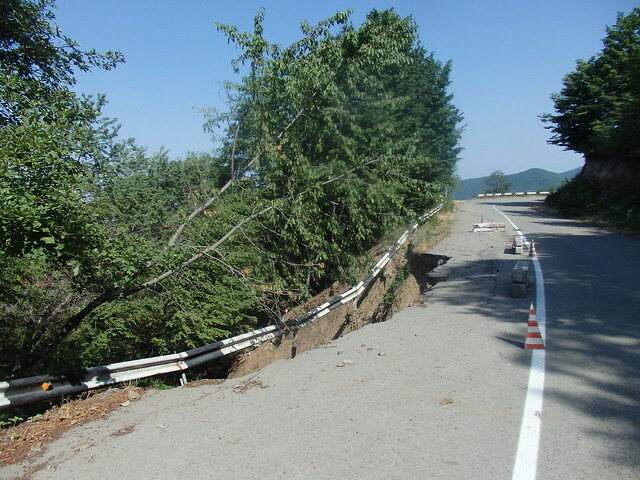 My heart sunk at the bottom – the descent had been on perfect asphalt but here the tarmac suddenly stopped and the rest was just dirt track. Great. 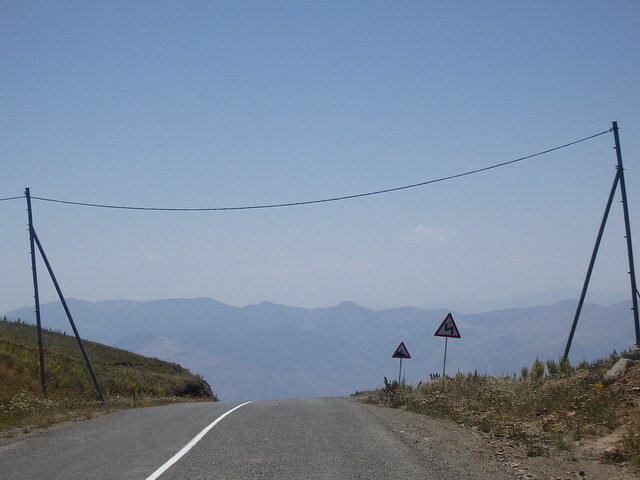 The ascent warning sign was so steep that I knew I’d have trouble getting enough grip to get up on my narrow tires. It took about 90 mins to get up and all the while the cable car between the mountains kept passing over my head. I should have asked if I could have just put my bike on it, instead of cycling all the way down and then all the way up the other side. Apparently it’s the longest cable car in the world – 5.7km. 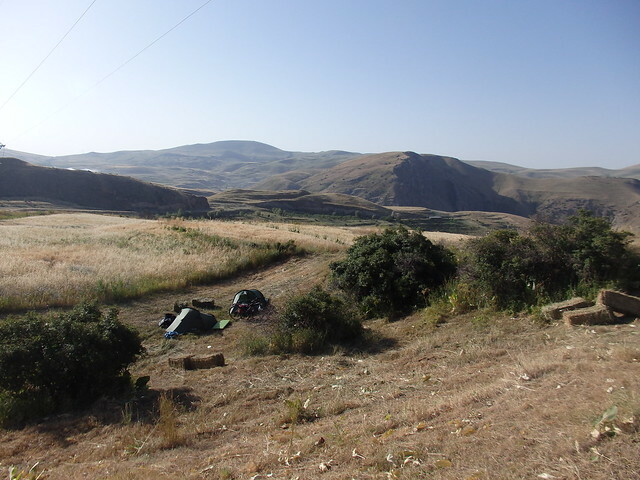 I was going to look for a guesthouse to sleep in (I needed a shower badly after 3 sweaty days ending in my tent) but there was no ATM around and I’d ran out of money so I stuck my tent down next to the tourist info centre a stone’s throw from the monastery. 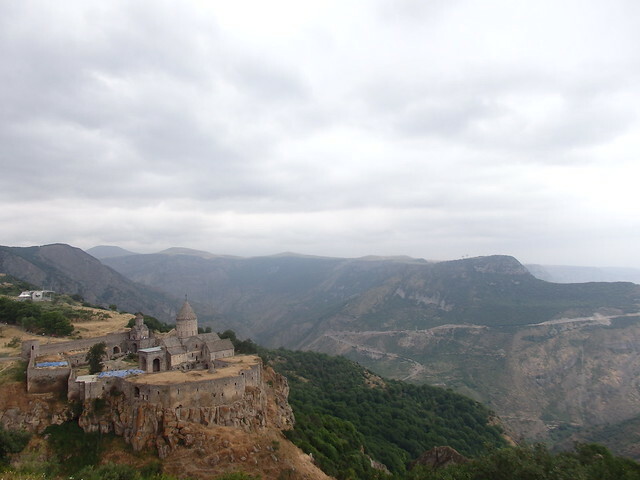 Tatev monastery was very cool – I’m a bit ‘monastried’ out, but I had energy for one last one. 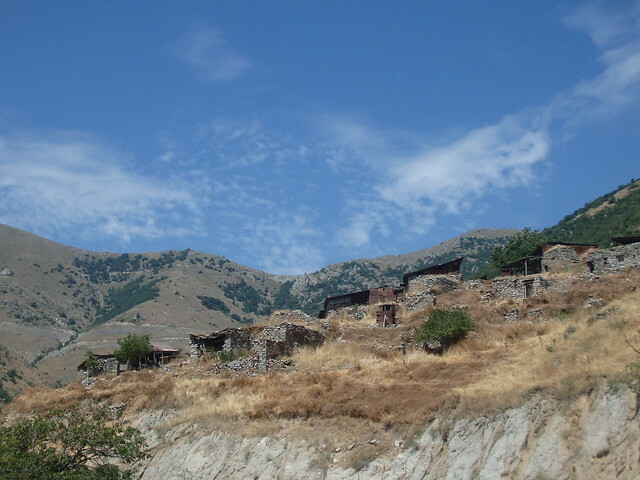 I was able to Couchsurf in Kapan, having found my first host since Turkey. I’d lost faith a little in the Couchsurfuing communities in the Caucuses – the responses from my public trip had just been people promoting their businesses. 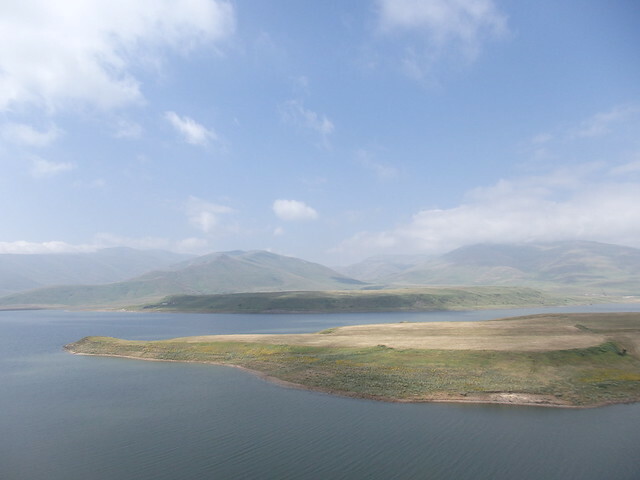 My host had given me a heads up that there was a water festival in Armenia this day – so at least I didn’t react badly when some guys starting squirting me with water bottles as I arrived into town. 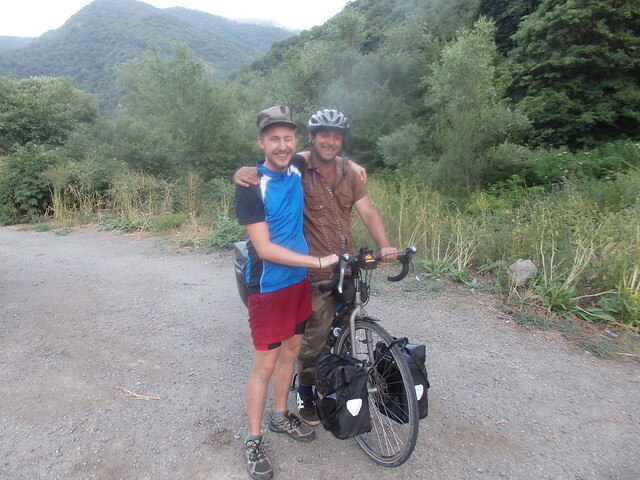 There was another guy staying with him too – who turned out to be the Irish guy that I’d met in the Iranian consulate in Trabzon about a month ago! 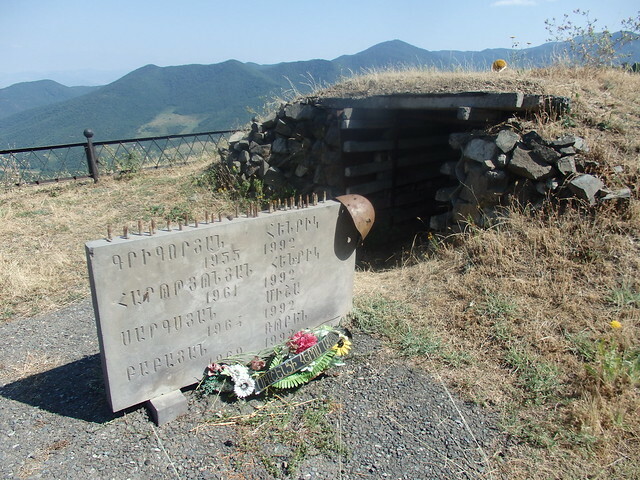 Kapan was a very strange place. 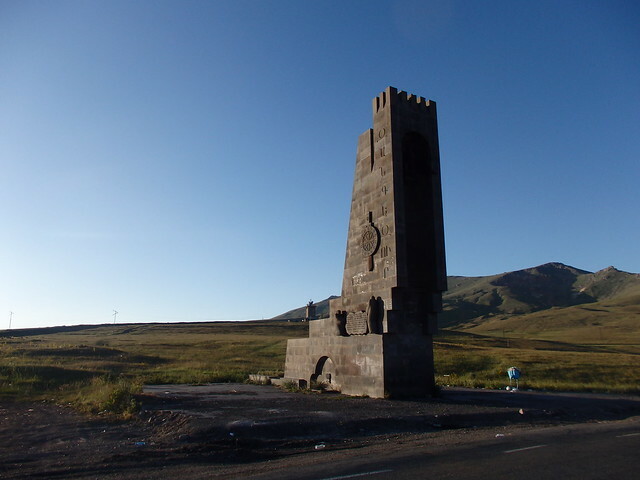 It sums up Armenia for me – beautiful country side, and horrible towns. 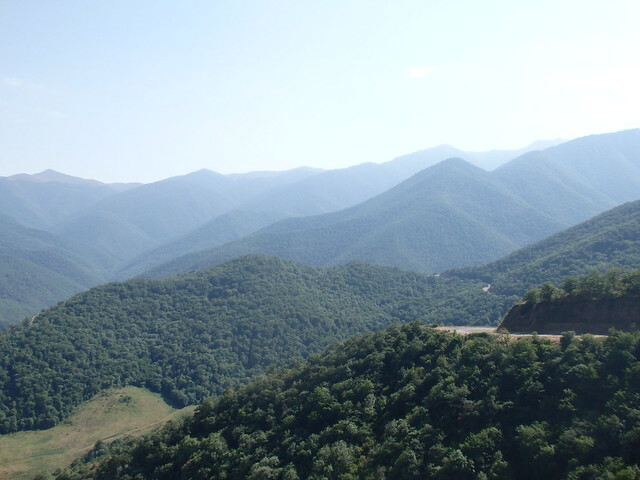 Kapan was the same grey/brown colour that everything is in Armenia, set against a deep green background of tree-lined streets. Imposing Soviet blocks of flats dominate the streets and the people just hang around doing nothing – staring you down at every corner. It looks so Russian to me. 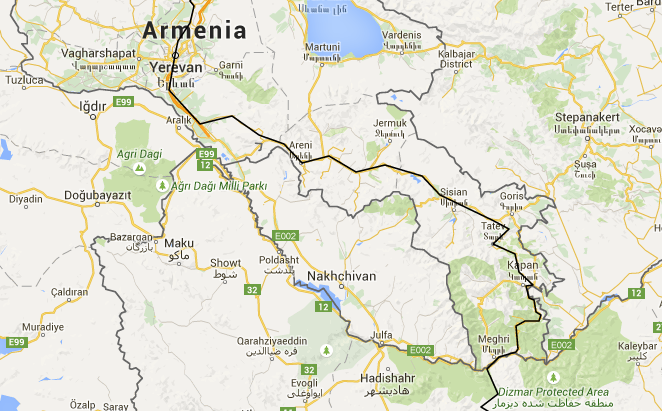 I don’t know what I expected Armenia to look like – but it wasn’t like this. 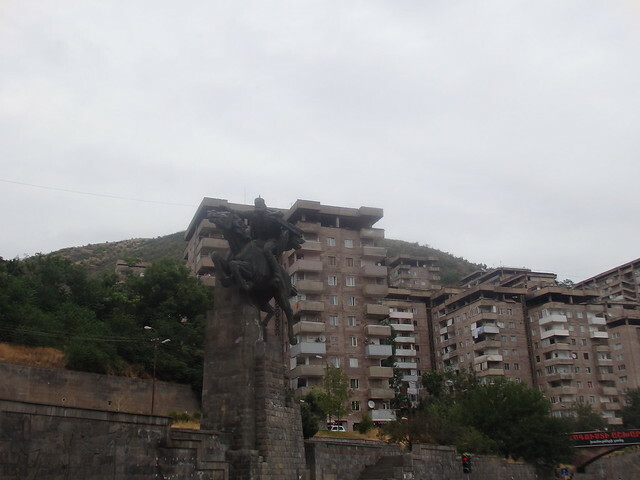 Outside of Yerevan everything is run-down and knackered. Actually everyone seems pretty pro-Russia here. The same things I heard from those in East Europe about Soviet Union nostalgia – more equality, more guaranteed jobs etc are repeated to me here. 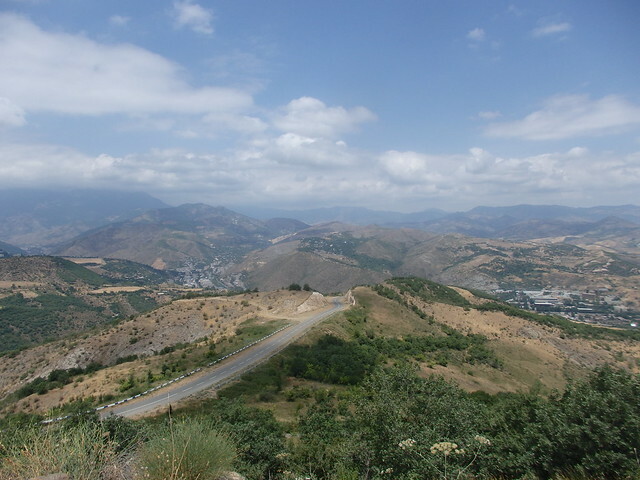 From Kapan there were two roads to Iran – the main road, and another longer and more challenging (but apparently more scenic) mountain road. As usual I went for the latter. 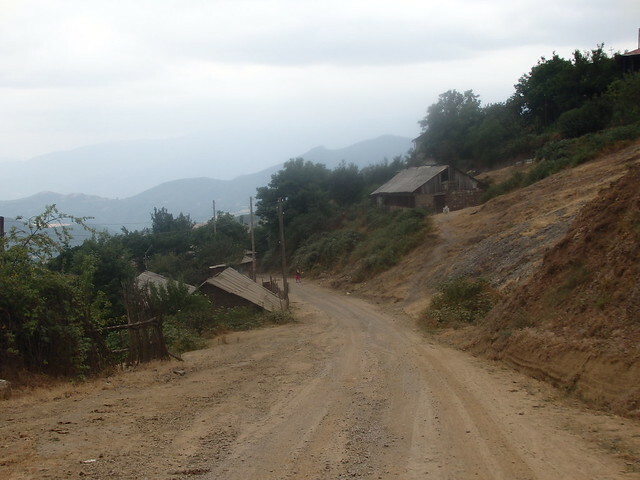 From the start the road climbed straight up from Kapan. We’re talking 100m ascent per kilometre. 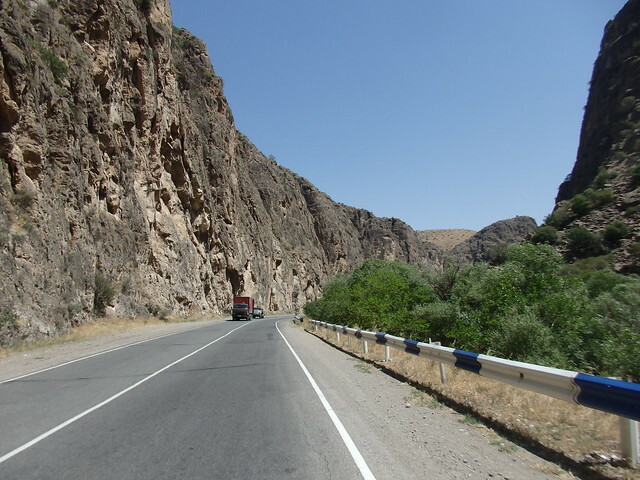 But the road was simply stunning. Watch where you put your tent! The heat was exhausting but the mountain views kept me going. 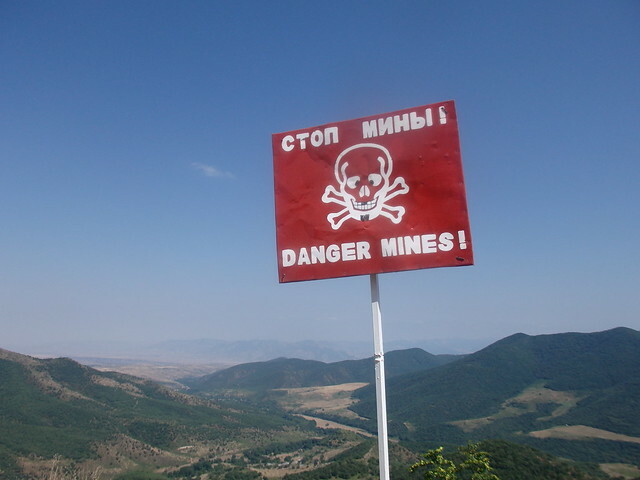 At one of the mini-passes there was a war memorial next to a warning sign for mine fields. 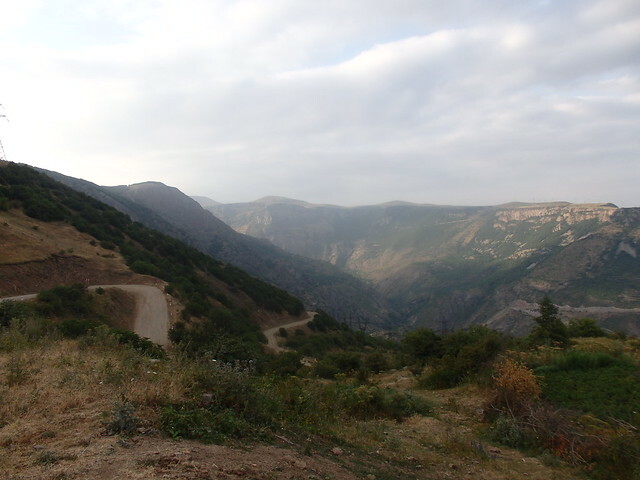 In view was the former Azerbeijan border (which is still marked the same on Google maps). Before the big pass I was invited for a swim by some village kids, which I gladly accepted and then I cracked on up the mountain. I looked for somewhere to camp near the top. 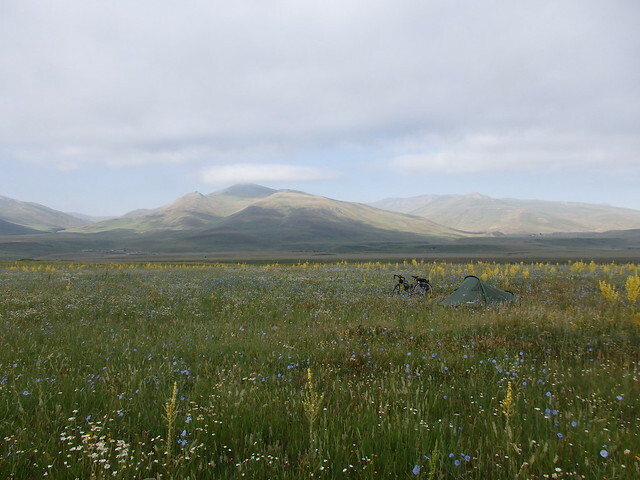 You’ll have noticed by now that I’ve been deliberately camping near the passes at about 2,000m where possible just so I can get some colder air at night. After lots of shots (of both vodka and my camera) they left and I was alone feeling, once again, much more drunk than I would have liked. They kindly gave me the left over food and then threw the rubbish into the bush. I hate how people do that and I just don’t understand it. They’ve clearly driven here to drink because it’s a picturesque spot, and then they just chuck their rubbish on the floor… It makes no sense! I didn’t have much time before dark so fumbled around getting my tent up as quick as I could and passed out in a record time. It wasn’t too far to the pass the next day and Armenia had saved it’s best for last for me. Over the top the landscape was totally different – huge tree-less mountains with sharp edges strutted straight up all around me. It was breath taking! 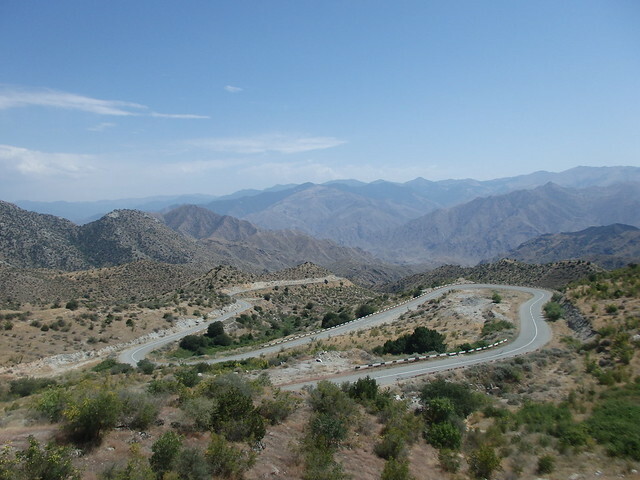 The descent was glorious – I tightened my breaks and soared down the mountain side trying to resist the urge to let my bike go more than 60km/h around the bends. I’d been thinking to myself how I hoped today wouldn’t be the day something would go wrong with the bike as I’d have to wait hours for a car. Clearly that was a dangerous thought and when I hit a pothole a little too quick I didn’t need to look to know that my back tire had punctured. Well – it was going to happen sooner or later. 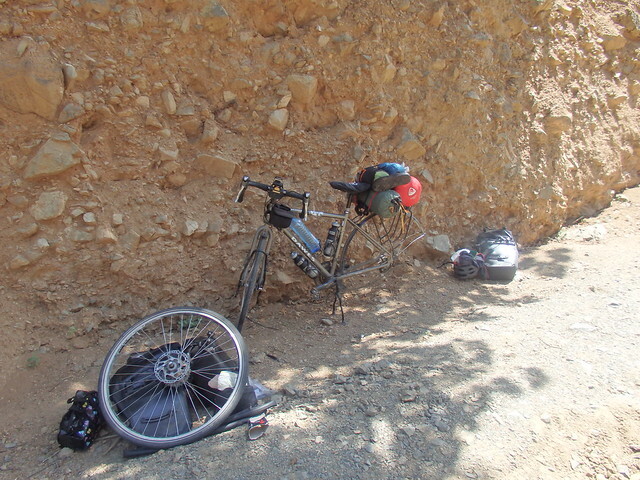 I lasted a day under 6 months and more than 8,500km without a puncture. I hadn’t changed a flat for years, so it was a moment I’d been dreading. 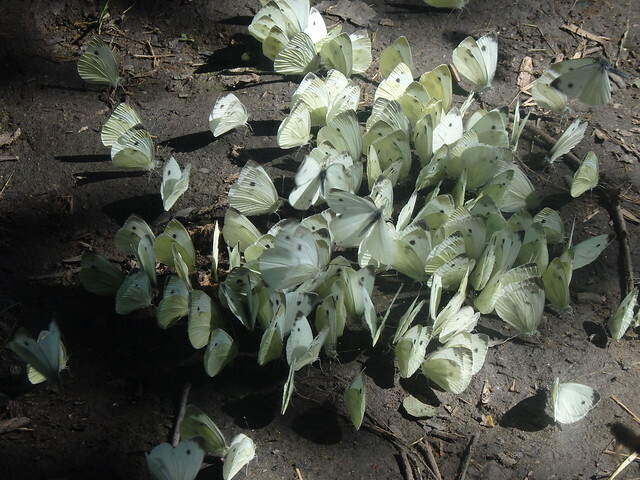 The worst thing was that there was no shade and it was way too hot to be standing still under the sun. So, I carried all my stuff up to a point where I could find some shade and changed my tubes without too much trouble (although it took an embarrassing amount of time). 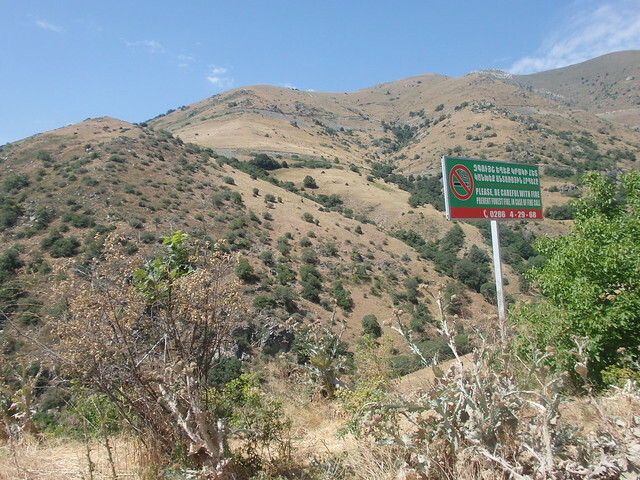 I’d read on one of the park signs that this area is has unique micro-climates in the valleys and that the last pass blocked the Iranian heat from Armenia. 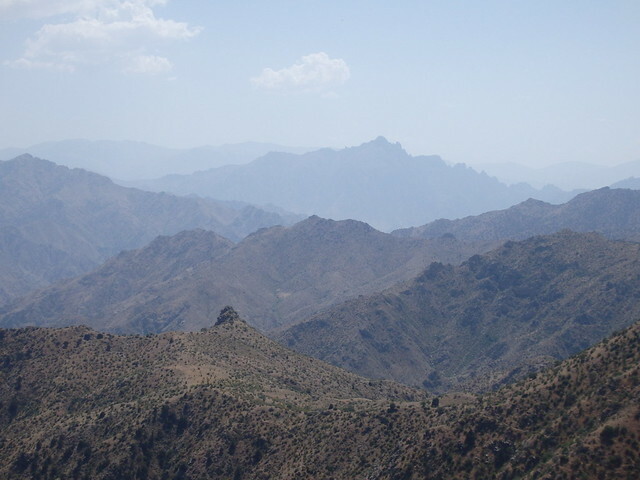 I could feel that warmth now – the landscape was dry and arid and there were warning signs up about fires. I was stopped on the way down my a bunch of guys around my age who asked me out of the car window ‘hello! do you drink pivo?’ to which I replied ‘yes’ – imagining a nice cold beer being handed to me. 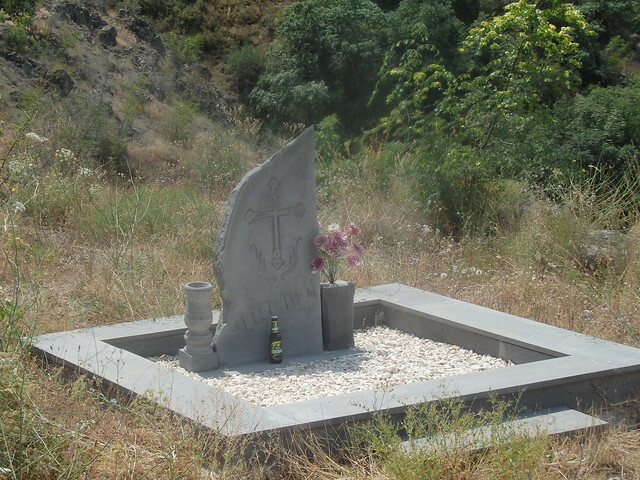 Instead I was given a bottle of the warmest beer I’ve ever drunk in my life but, as they proudly showed me – it was Ararat beer (so I guess that makes it ok). They put a couple of large stones under the front wheels (clearly the brakes weren’t working) and kept me company while I tried to finish the warm beer. 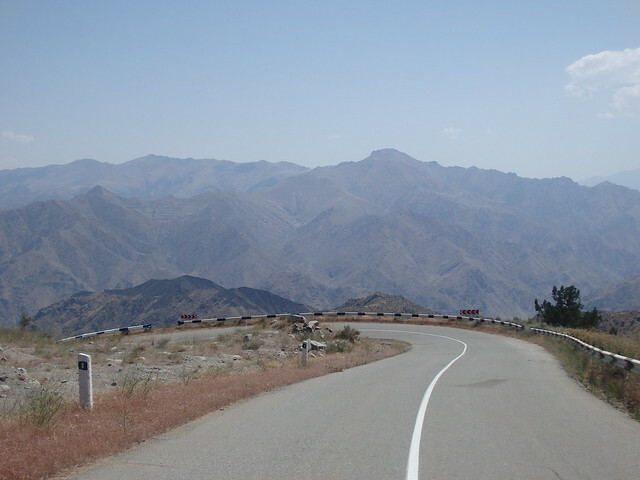 They asked me why I’d come this way – when the main road road was quicker and less mountainous, and apparently here there were too many snakes, scorpions and bears too at the top… That’s one of those things that sounds easy to explain but people just don’t get it. 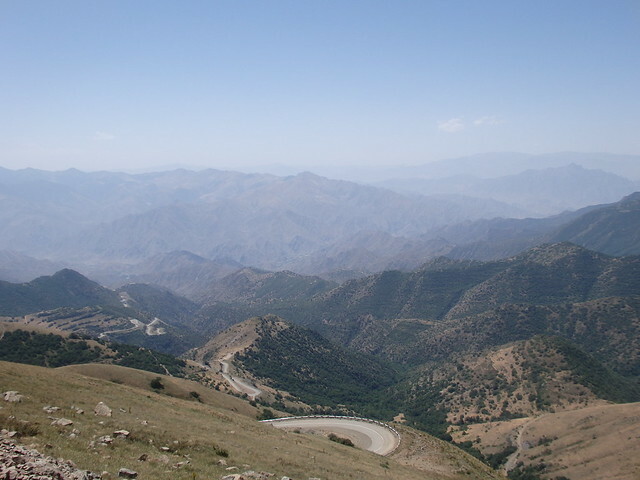 I continued on to the Iranian border. 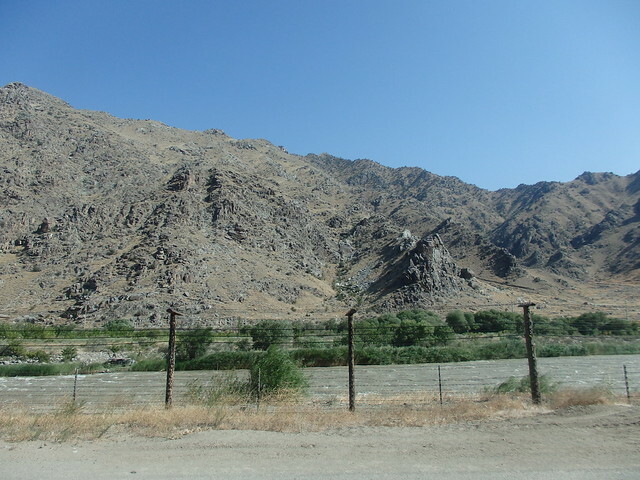 When I reached the dividing river the sides were fenced off by large rows of barbed wire. There were numerous lookout towers with armed guards on top. 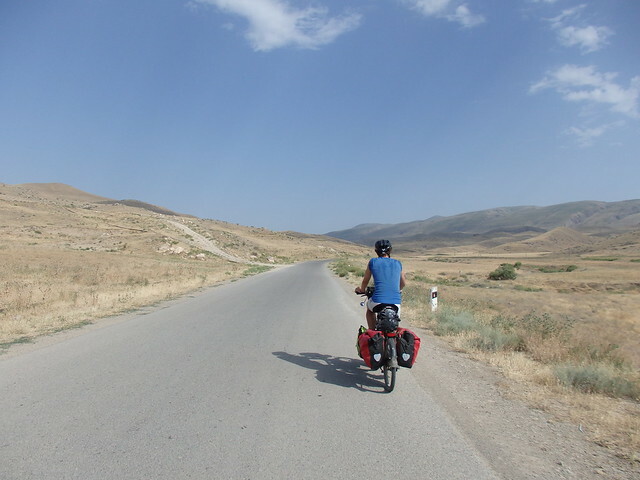 It felt strange to be cycling next to Iran, and even weirder to have this military presence around. 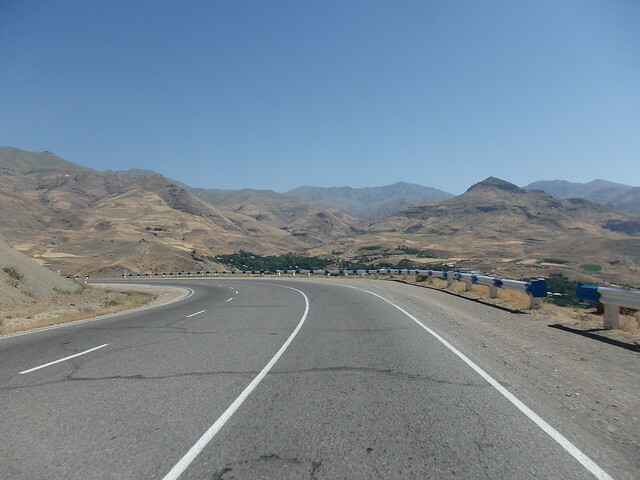 I stopped in the border town Agarak, a fairly unexciting town which had an impressive backdrop against the mountains. I stayed in a hotel – celebrating my 6 month anniversary a day early as this was the last chance I had of a getting a (cold) beer. 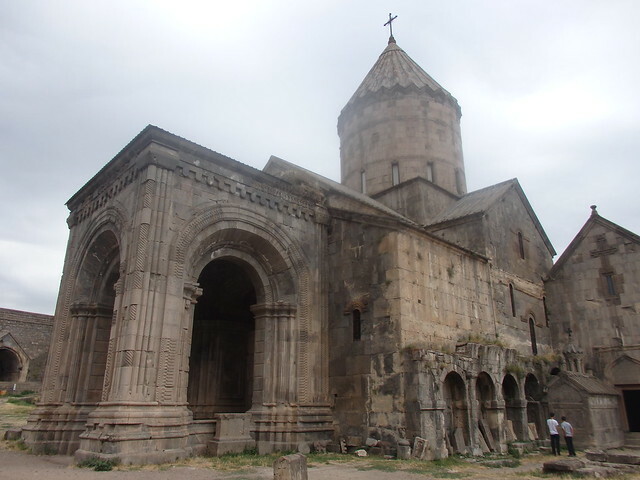 I’ve enjoyed Armenia – it’s an interesting country and I’ve left more confused about Armenian identity than when I arrived. That’s not a bad thing – it just means that there is a lot left to explore and understand. 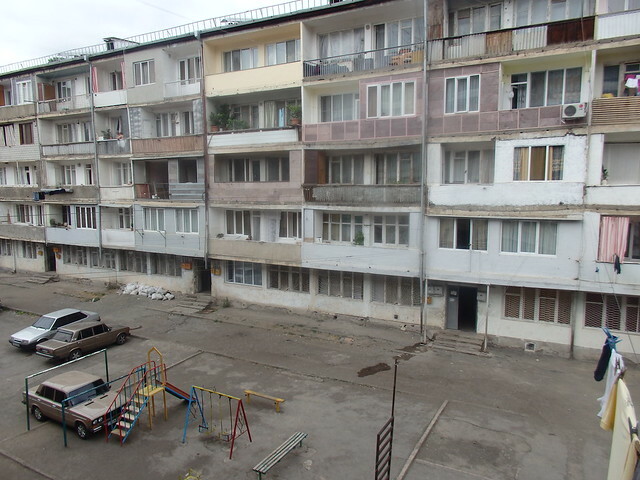 It saddens me to see many places so poor – especially when there is so much money in the neighbouring countries that Armenia has closed borders with – Turkey and Azerbeijan. It must be strange to live in a country where most of your land borders are closed. I also find it odd that they discuss the genocide so much – of course it should be talked about (a lot), but I find it strange that it can be so much more important than present issues. 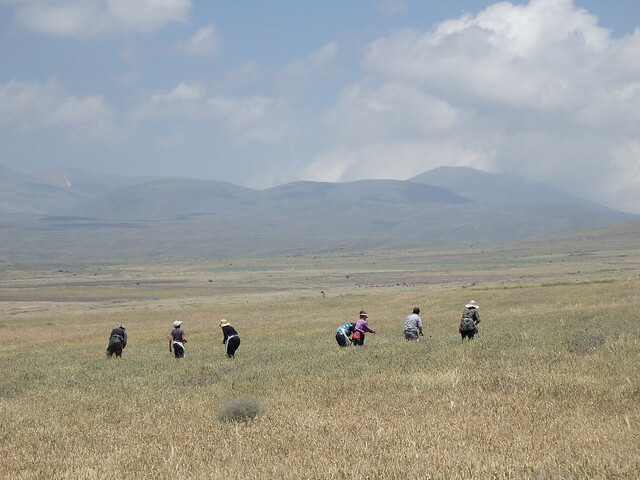 I wish the Turks would turn around and say ‘OK guys – we admit it’, but then I also wonder what the Armenians would say? It’s like they’d have nothing left to fight about (although I wouldn’t say that to an Armenian). I imagine this is just a more present topic at the moment anyway, with the 100 year anniversary. They’re a proud bunch, the Armenians. It verges on being exhausting at times, but I don’t think patriotism is ever a bad thing and most importantly – I’d like to come back here again!